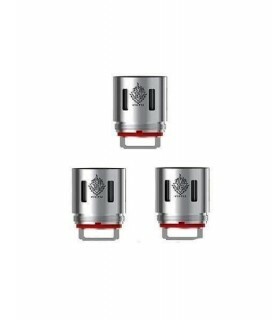 Tesla Biturbo Mech Dual RDA Starter Kit is a powerful device that has the ability to fire two RDAs at the same time for greater vapor productions. Users can add two flavors e-liquid into RDAs and enjoy a complex and unique taste. 1. Steps for Installation: Before starting, make sure your hands are clean. Take RDA apart, install the pre-wrapped wire, and position and cut the ends of the wire off. Insert the cotton, and place it in the middle. Cut the cotton at an angle and make sure it's not too short or too long. Wet the coil with e-liquid and adjust the cotton. 2. Adjusting the Airflow: Adjust airflow through rotating the stainless tube, where a total of two airflow holes are located. 1. Over Puffing Protection: The device will deactivate after continuous puffing of more than 10 seconds. Then corresponding LED will flash for 8 times, and the device will enter the stand-by mode. 2. Reverse Connection Protection: If batteries are inserted incorrectly, the device will fail to power on and will prevent any damage to the chipset. 3. Low Voltage Alert: When the voltage drops below 7.5V, corresponding LED will flash for 15 times and the device will power off. 4. Atomizer Short-circuit Protection: When an atomizer short circuit occurs, corresponding LED will flash for 5 times rapidly and the device will enter the stand-by mode. Protections: Over puffing protection/ Reverse connection protection/ Atomizer short-circuit protection/ Low voltage alert.